We love iOS apps, but there’s a lot of junk and cruft out there. Our Staff Picks column separates the great from the mediocre, offering our expert advice on the best apps, games, tools, and programs in the iOS App Store. Dark Sky has long been one of my favorite weather apps for the iPhone, but it’s seen few updates this past year as its developers focused on growing their new project, Forecast.io, and their public weather API of the same name. 2014 is a new year, though, and the Dark Sky Company is starting it right, with a full redesign of Dark Sky for iOS 7. 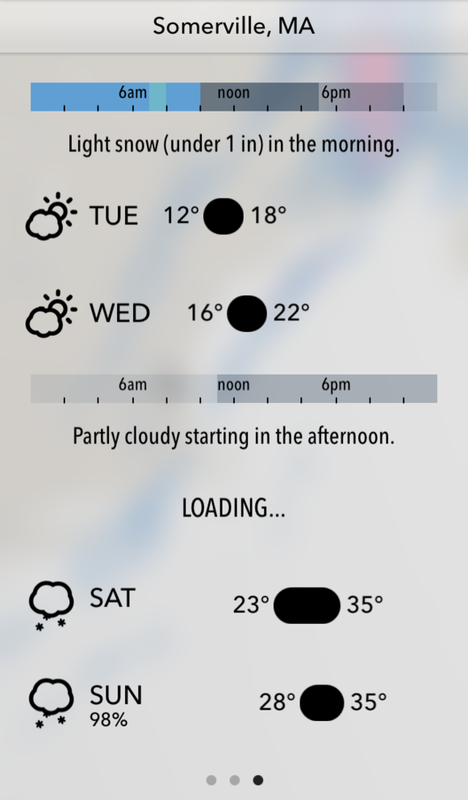 While the icon remains a gloomy dark-and-blue, the app itself has ditched the dark textures for a grey-and-black palette reminiscent of the company’s Web-based weather service, Forecast.io. Upon opening the app, you’re greeted with an overview of your current location’s weather, with a map of the current radar blurred in the background. Unlike the Dark Sky of old, this version provides a bit more information for the meteorologically curious: Not only does this initial screen offer information about the current weather and the next hour’s predictions, but it also tells you the current temperature (and whether that weather is heating up or cooling down), feels-like temperature, and the nearest storm in your vicinity. You can tap on the temperature to get even more information, such as wind, humidity and dew point, atmospheric pressure, and visibility. This is also where you can set up Dark Sky’s eerily prescient rain and snow notification service, which buzzes your phone with an alert whenever there’s precipitation in the air (though you can modify the threshold in case you prefer alerts only for major storms). You can view Dark Sky’s animated radar map (now with temperature and precipitation options) by swiping to the right on this screen, but that’s not all the weather-related information to be found in the app—there are now two more screens of data, accessible by swiping to the left on the main screen. (On the iPad, these are consolidated into one screen that you access by swiping upward from the bottom of the screen.) The first deals with sky, temperature, and sun information for the next 24 hours, while the second focuses on the traditional seven-day forecast. Nearly all of this extra information takes visual (and likely data) cues from Forecast.io, allowing Dark Sky to potentially rise from one-trick-pony status to compete with other full-featured weather programs on the App Store. At the same time, it doesn’t clutter the interface nor take away Dark Sky’s original magic; if you just want rain and snow notifications and the occasional hourly forecast, the app is happy to help. There is one downside to this fount of information: lag. While it’s great that Dark Sky strives to serve properly updated data (and so much of it), it comes at the price of the occasional “loading” screen. It makes an otherwise zippy app feel a little sluggish, even if the information is worth the load-time. Despite the mostly-excellent redesign, the monochromatic skin falls a little flat for me: While there are snatches of color on the radar map and when representing precipitation, it all comes off a bit too dull if your location lacks a squall or a thunderstorm. It certainly makes for a stark contrast if you compare it with any of its colorful competitors. The map also feels a bit cramped in relation to the rest of the design, with the times on the timelapse scroller wedged tightly between black separators. (It’s a bit better on the iPad, but goes too far in the opposite direction, ending up with an oddly sparse look.) There’s a bit of multitouch bugginess in the map, too; while you can theoretically swipe left to return to the main screen on the iPhone, I found myself more often careening into the Atlantic Ocean. Eventually, I figured out that diligently tapping and dragging slowly on the far right edge was the way to go, but casual users may find themselves befuddled. Thankfully, the developers also include a “close” button in the top right corner for those disinclined to swiping. Whether you’re a Dark Sky devotee or the casual cumulonimbus connoisseur, there’s something in the 4.0 update for you. 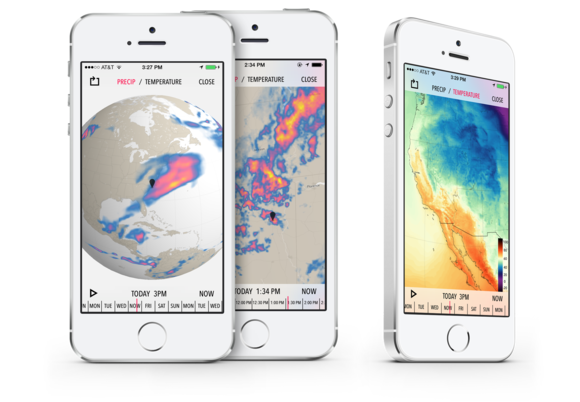 Backed by data from the Dark Sky Company’s vaunted meteorological API, the app melds new weather information and a redesigned interface to enhance its original purpose. Longtime users may find a tad more lag when viewing detailed weather information, but Dark Sky’s data is well worth the wait. Whether you're a Dark Sky devotee or the casual cumulonimbus observer, there's something in the 4.0 update for you. 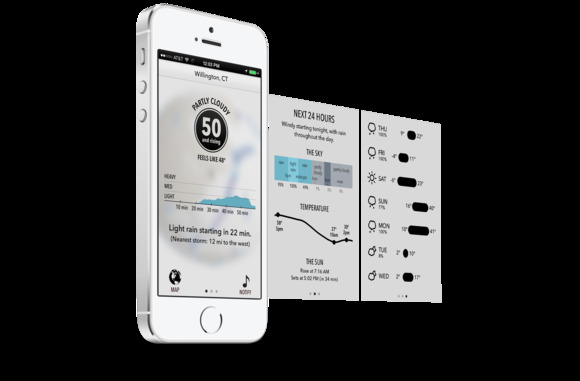 Backed by data from the Dark Sky Company's vaunted meteorological API, the app melds new weather information and a redesigned interface together to enhance its original purpose. Longtime users may find a tad more lag when viewing detailed weather information, but Dark Sky's data is well worth the wait. Only available in the U.S., U.K., and Ireland.